Big news… or, maybe not ! 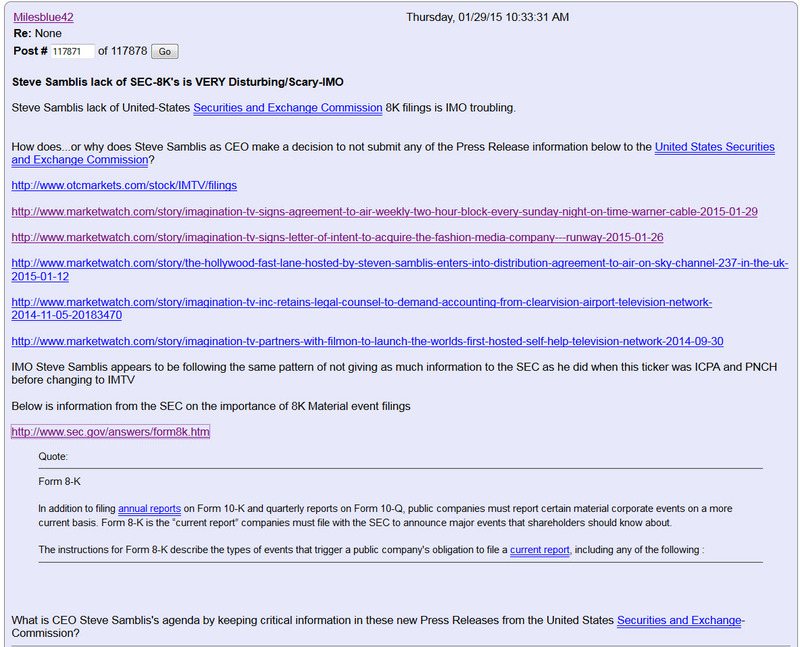 Well folks… Mr. Steven M Samblis, CEO of IC Places, Inc. has released 2 new press releases in the last few days. In one PR he promotes the benefits of buying another company. In another PR he promotes a deal signed with a cable company to air shows from Imagination TV. Now normally one would think these are significant deals Mr. Samblis has struck, however, since he has not filed an SEC 8-K document, which (see graphic below) as the SEC states “companies must file with the SEC to announce major events that shareholders should know about.”… these agreements must not amount to much. If they were significant, or “major” as the SEC defines it, the events must be made public via an SEC 8-K. Since there has been no filing, the events must not be significant, or “major” as the SEC defines it. As can be seen in the below message board post, MilesBlue42 has the same questions about a long line of previous press releases. 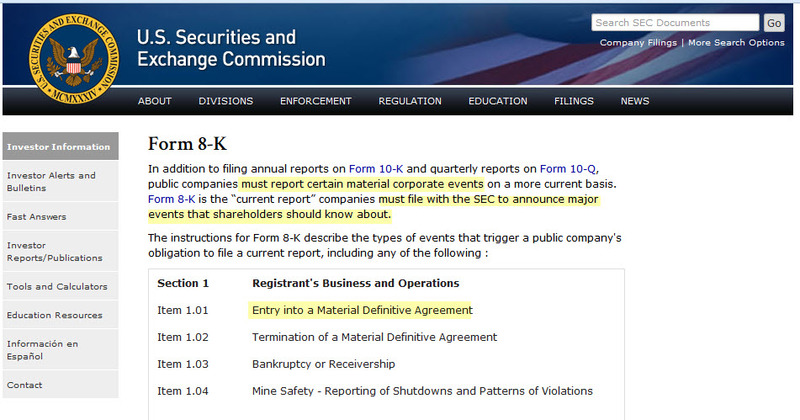 MilesBlue42 asks, as well as all other shareholders (and potential shareholders) should be asking… WHY has there been no SEC 8-K filings on any of these, what many would call, “major” events??? Now the SEC seems pretty clear on the subject of releasing major events via an 8-K filing, but even if the event would be in the grey area for rising to the level of a major event, why would Mr. Samblis not file just to eliminate any possibility of running afoul with the SEC. WHY ??? One would think buying another company rises to the level of “major”. Why would Mr. Samblis not file an 8-K on that initiative??? And… WHERE is the money coming from to buy the new company ??? IC Places has not reported any revenue in quite some time, perhaps as long as 2-years. Yes, some company purchases are based on stock swaps, but certainly the new company would have done their due diligence in researching the value and history of the company they would be accepting stock in lieu of cash from. Many potential investors would likely run like a scalded dog from IC Places stock when they see the history of the company and of it’s CEO Mr. Steven M Samblis. If 4 reverse stock splits, (and the last 2 of which were done within a year of one another), and, the stock PPS now sits in the tripps… doesn’t scare any investor, we don’t know what would. Why would any company accept this stock for payment ? Don’t be fooled folks… do your research on this company, and it’s CEO, Mr. Steven Samblis. Spending five minutes on Google should give you all the information you would need to make a sound investment decision. So… investors gotta ask themselves… where’s the money coming from??? The company hasn’t shown any revenue, (let alone any profit), in well over a year, yet there appears to be plenty of money for lawyers. 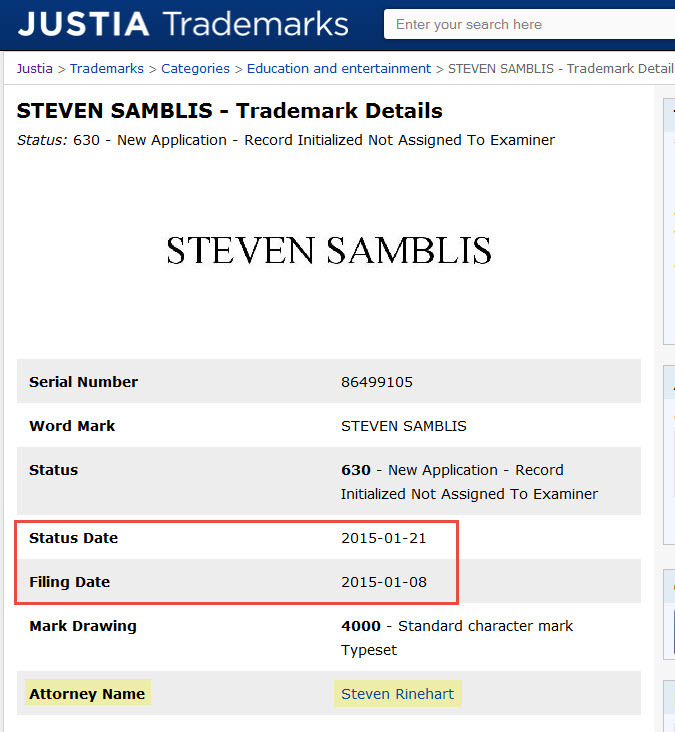 Check this out… Mr. Steven M. Samblis is spending even more money on attorney fees chasing his narcissistic fantasy of his name being a trademark. Even if it would be granted… what does that do for the company relative to revenue and profits ??? Are people going to flood his website for motivational videos because his name is trademarked ??? Sounds like this is more about his narcissistic driven ego than a quest for revenue and return on investment for investors. Will the company ever do better than its doing when decisions like these are driving the direction of the company ??? We wonder how much of investor funds are being thrown at this effort ? Shameful and embarrassing in our opinion. So, since the UDRP decision (details here), deciding in favor of Friends keeping the sites in dispute… Mr. Steven M. Samblis, CEO of IC Places, Inc. has created a new website bearing his namesake. We have viewed the site, and have to say up front, as sites go, it’s not a bad looking site. We have said before that Mr. Samblis can build a decent looking site. We are not taking that away from him. However, it appears Mr. Samblis is attempting to mislead viewers (investors) yet again. We are referring to the references to his name being a “tm”, trademark. Pictured below are the instances from the site we reference. Now… we (and likely everyone else) could really care less if Mr. Samblis says his name is trademarked or not, but the larger picture here is the fact that apparently he feels the need to mislead visitors to the site. As many readers of this blog know, Mr. Samblis was unsuccessful at his attempts to force his will on Friends to get our sites. Readers will also know that Mr. Samblis needed to prove three aspects in order to prevail. If all three are not proven, the attempt is unsuccessful. The very first issue Mr. Samblis needed to prove was the issue of trademark rights. Namely, Mr. Samblis needed to prove he had rights (common-law or otherwise) to the professed trademark of Steven Samblis. The arbitrator (an attorney) who decided the case was of the opinion he did not prove such (and therefore did not need to decide on the other issues). See the excerpt below. 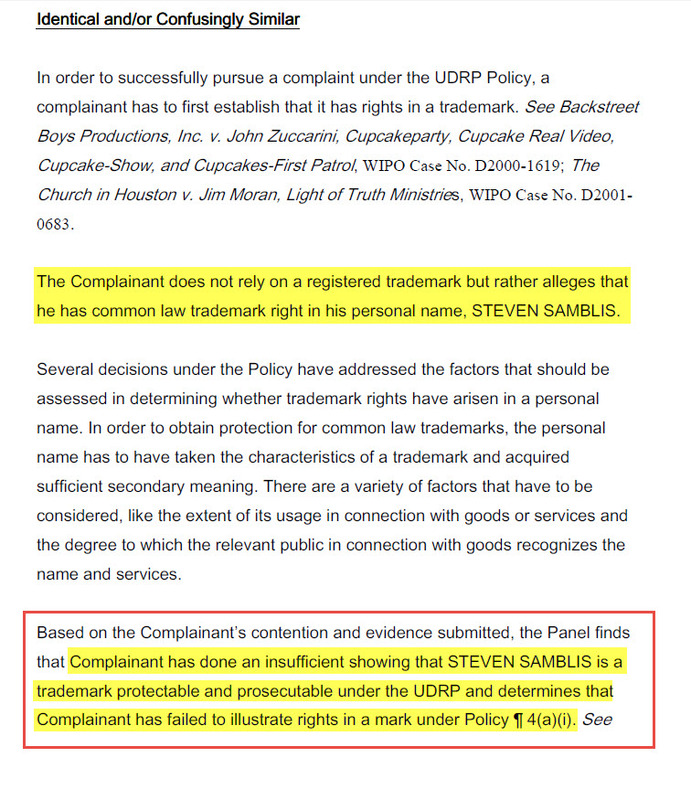 Quoting from the decision as seen above… “Based on the Complainant’s contention and evidence submitted, the Panel finds that Complainant has done an insufficient showing that STEVEN SAMBLIS is a trademark protectable and prosecutable under the UDRP and determines that Complainant has failed to illustrate rights in a mark under Policy ¶ 4(a)(i). See Yao Ming v. Evergreen Sports, Inc., FA 154140 (Nat. Arb. Forum May 29, 2003…”. Friends did a quick check on the United States Patent and Trademark Office website (here) and found only these 2 registrations, and they are both listed as “dead”. Of course there is no registration of the name, Steven Samblis. Additionally, as Friends referenced in their response regarding the use of a personal name as a professed trademark, the arbitrator makes note of… “Under such view, any human being on earth could claim to have rights in a legal trademark dating back to the first day they started a job—a notion which is not possible under trademark law.”. See the excerpt from the law itself below. So… apparently Mr. Steven Samblis is so narcissistic about himself, he needs to aggrandize himself to the public into thinking he is something special that his name is a trademark. However, obviously the arbitrator held a different view, and, lacking some legal documentation supporting otherwise, we feel the use of the name being a trademark is purely misleading. According to numerous sources, it is extremely difficult to trademark a personal name. It is doubtful Mr. Samblis could ever get his name trademarked, and he certainly shouldn’t be misleading readers into thinking it is, especially as the CEO of a publically traded company . Mr. Samblis… your name is not a trademark just because you say it is. Prove us wrong and produce the documentation supporting it is. Debt, Debt, and more Debt ! The long awaited (and long overdue) IC Places, Inc. SEC 10-Q filing has finally been filed. Mr. Steven Samblis, CEO of IC Places, Inc and ImaginationTV certainly must be proud! WOW… a quick read of the most recent quarterly filing, seen here, is quite a scary read. These are just a few of the many items that appeared to jump off the page as you read through the document. First up… Revenue and Operating Loss. As you can see by the graphic below (click to enlarge), this is yet another filing (in a long line) that reports NO revenue… not even $1.00. And… it also reports… drum-roll please… a 10-million dollar operating LOSS ! WOW… sure makes an investor want to run right out and throw some hard-earned money at this company ! One has to ask themselves… what kind of talent does it take to work for 2-years and make no money, and, run up a 10-Million dollar operating loss ??? Next up… $14,250 wasted on a “late filing” fee due to the late filing of the report. Must be nice to have that kind of money to throw down the toilet because you were too busy doing something else to get the report in on time. Oh wait… it’s not your money… it’s INVESTOR money ! Next up… and you’re going to love this… the Flagship effort of the company of late, namely the ImaginationTV endeavor, was GIVEN to IC Places, Inc for “no consideration“. As stated in the document, the assets were “given” to the company “given the nominal value of these assets“. Weren’t investors told that the ImaginationTV effort was going to lead this company back on the road to profitability? Seems like investors were sold a bill of goods that was, now admittedly, worthless. Next up… debt, debt, and more debt ! The company issued so much convertible debt, that if/when sold into the market, would exceed the authorized share count (which investors thought was way too high anyway), by a little over 40-Billion shares. Yes folks… that a “B” for BILLION ! Wait, what… 40-BILLION over? How do you miss a hard stop by 10-fold ??? Truly amazing. It takes a special kind of CEO to accomplish a feat like that ! Way to go Mr. Steven Samblis ! As Meadow2009 points out in his post below… that would make the company have a market cap of over 52-Million dollars. WOW… 52-million for a company who’s primary focus of late is admittedly worth “nominal value“. Seems like a slight disconnect there, wouldn’t you agree? So folks, there you have it. Read the report yourself and you will be amazed how any investor could, even in their wildest dreams, consider this company a viable investment. In fact Mr. Samblis admits in the document that the issues raised in the report “raise substantial doubt about the Company’s ability to continue as a going concern.”. These are just heartwarming and reassuring words, coming from the CEO himself, that would make an investor run right out and plunk down some hard earned cash for a few shares of the company stock. Oh wait… a few shares would only cost you about a penny at the current PPS.